...... country code automatically. If the phone number does not contain the international country code then the user can select the code from their own Favourite countries in the Phone Buddy. The system also provides redial and Quick dial (favorite phone numbers) facilities too. Automatic phone dialing from almost any Microsoft Windows Application! When the call is selected Skype and Jajah will call you on your own phone and then dial the phone number you selected, using cheap or free phone call! - Install in minutes ! - Use with almost any windows software !!! - Integration with many of the top CRM and Accounts applications, such as Quickbooks, Microsoft CRM, Microsoft, Access, Microsoft Outlook, Goldmine, ACT, etc. 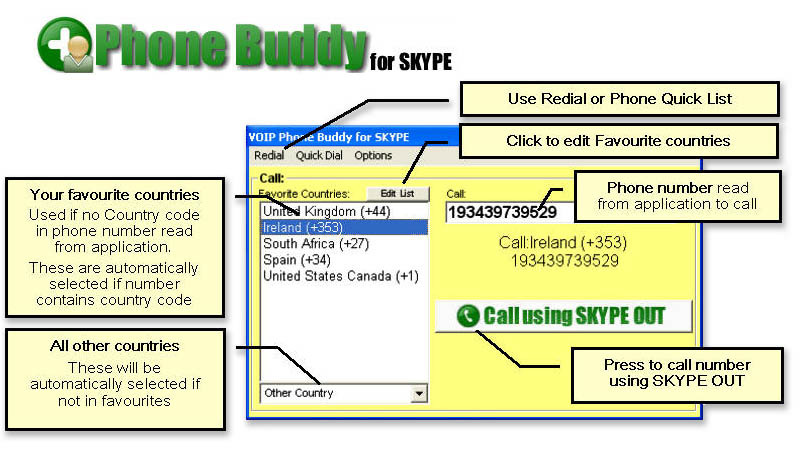 Qweas is providing links to VOIP Phone Buddy - SKYPE 2.0.23 as a courtesy, and makes no representations regarding VOIP Phone Buddy - SKYPE or any other applications or any information related thereto. Any questions, complaints or claims regarding this application VOIP Phone Buddy - SKYPE 2.0.23 must be directed to the appropriate software vendor. You may click the publisher link of VOIP Phone Buddy - SKYPE on the top of this page to get more details about the vendor.